Grey hair signifies that you are wise and mature. However, no one wants to get grey hair early in life. As a result, many people are using conventional hair dyes to cover any signs of grey on their heads. However, these dyes can have dire effects because of the chemicals that they contain. For instance, you can lose hair, affect your health and even increase the density of grey on your head. Instead, opt for methods that will provide safety and pure relief for your hair. Research has already proven that genetics can play a role in making your hair greyResearch has already proven that genetics can play a role in making your hair grey. However, other factors can also contribute to such occurrences. These factors include stress, vitamin deficiencies, and poor nutrition. Knowing that you are a person that cares about their appearance, there are methods that you can use to get rid of the grey in your hair correctly. These methods will give you a vibrant and healthy look. Additionally, some of these methods have ingredients that can reverse the growth of grey hair while others reduce such hair growth. Using blackstrap molasses can be a great relief for any incoming signs of grey hair. This is because it stops the growth of such hair. The effects are especially seen considerably if the molasses is used regularly.Black molasses is usually extracted during the sugar making process. It comprises the contents that are left behind after the sugar crystals have been removed, hence, its thickness and dark color. Also, the black liquid is filled with minerals that work towards reversing the color of your hair. Black molasses contains iron, selenium and managanese, minerals that are responsible for preserving the natural color of your hair. It also contains copper that aids the production of hair pigments. Other minerals contained in the molasses include calcium and magnesium that are vital for growing healthier and stronger hair. Besides, black molasses has health benefits for your body. It can improve your bone health, combat stress, relieve arthritis, stabilize blood sugar levels and clear the skin leaving it with a glow. All you have to do is eat the molasses in alternating days for a few months to get these benefits. This is one of the best treatments that you can use to reverse your greying hair. Also known as the nectar for hair, Amla will stop the growth of your unwanted hair. This is because it contains powerful antioxidants that are responsible for renewing your hair. Amla is also the most abundant source of vitamin C. Hence; the Indian Gooseberry will make your hair darker, fuller and thicker. Another advantage of using Amla is that it will reduce the excess heat in your body which is a primary cause of turning your hair grey. For use, you can drink fresh amla juice to improve the health of your hair and skin. You can even use dried amla powder and consume it with water, soup or a smoothie. Also, you can massage your hair with the amla juice you make at home because it will moisturize and nourish your scalp. Another way of using amla is through rinsing your hair with the alma water. Cleaning your hair with this water will condition and improve the texture of your hair as well as increase the appearance of your natural hair color. Having one onion a day might be the solution to eliminating your grey hair. Onions have abundant antioxidant enzyme catalase that can restore the color of your natural hair. Besides, the vitamin c and phytonutrients that is also present in onions act together with copper and folic acid to get rid of the grey in your hair. You can use the color reversing power of onion through eating. You can also apply onion juice on your scalp. This will reduce the amount of hydrogen peroxide that builds up on your scalp and thus reverse the grey color from your hair. Another way of using onion of for your hair is through the use of an onion juice hair mask. The mask has been used through history to remedy hair color. Also, the mask will help you to prevent hair loss; hence, it will make your hair grow faster and become softer and shinier. When at home, blend one onion and strain the juice using a sieve or a cloth. Apply the juice on your scalp and leave it for about thirty minutes and wash your hair. Follow the same procedure two times in a week. You can even add coconut oil to the onion juice. In case the smell of onions is too much for you, add one egg and one tablespoon of olive oil to the mixture. Then apply and clean your hair as usual. Catalase is a powerful antioxidant that will prevent the growth of grey in your hair. A research study suggests that hair turns grey because of the buildup of hydrogen peroxide in your hair follicles. The hydrogen peroxide bleaches the hair from the inside towards the outer parts of the hair. Hydrogen peroxide is a compound that is produced naturally in our bodies. It is usually a by-product of your metabolism. The compound is also formed when you are exposed to x-rays, stress, smoke, and pollution. Catalase serves the function of breaking down this hydrogen peroxide molecules into water and oxygen, both harmless products. When you are young will produce significant amounts of catalase to prevent your hair from bleaching. However, as you grow older, the amount of catalase that your body produces reduces as well. Additionally, stress and poor diet can be catalysts for reduced catalase levels in your body. Once your levels of catalase are down, hydrogen peroxide builds up in your hair follicles, and your hair pigments break down causing your hair to turn white. Therefore, it is essential for you to consume foods that have high contents of catalase. Such foods include almond, leeks, kale, turnip greens, cherry, wheat grass, cabbage, cucumber, carrots, potatoes, garlic, broccoli, collard, radish, and sweet potato. When you feed on these foods regularly, you will restore the natural color of your hair in time. Also called Eclipta Alba, this is an ayurvedic herb that is vital for hair loss as well as premature greying hair. Indians consider this herb to be the king of herbs because it stimulates hair growth while rejuvenating and nourishing hair. Therefore, if you regularly use Bhringraj, you will grow dark, thick hair. Besides, Bhringraj will make your hair soft, and it will add shine to your hair. You can use Bhringraj as a product in a hair mask. To make the mask, mix Brahmi powder, Bhringraj powder, and amla powder with water in equal amounts to form a paste. You can also substitute the water for coconut milk or yogurt. Apply the paste to your hair and leave it for about twenty to thirty minutes then clean your hair. Bhringraj powder can also be added to henna to dye hair. Another advantage of using Bhringraj is that it is healthy for the liver. When your liver is healthy, your hair becomes healthy in turn. You can consume Bhringraj powder by mixing it with honey or ghee in warm water. However, it is advisable that you consult a doctor before consuming Bhringraj internally. This is a herb that has been used throughout history to reverse greys, soften the skin and give a youthful look. The Indian anti-aging herb balances the hormones in the body. It also helps to calm the mind and boost the immune system. You can consume Ashwahandha supplements with your food. You can also use Ashwahandha powder. Add half a teaspoon in your milk or ghee to promote hair health and growth. 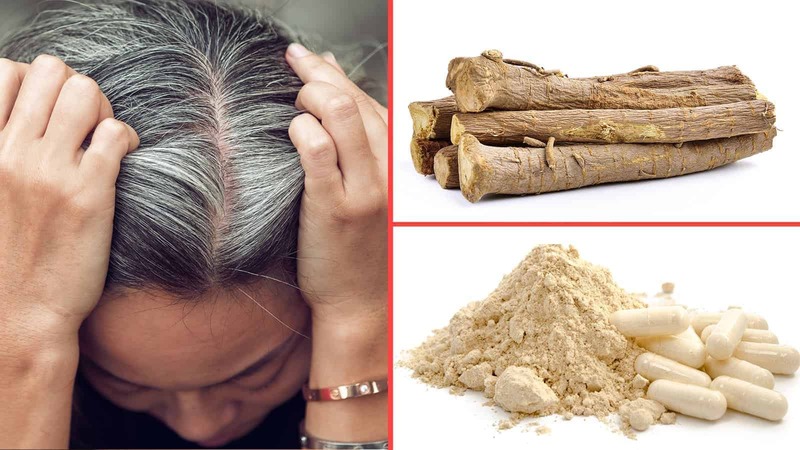 This is another supplement that you can use to treat your grey hair. Vitamin B12 will also treat shortness of breath, brain fog, and confusion. This is taken as a supplement because it is only found in animals in natural form. Food sources such as eggs, dairy products, meat, and fish contain Vitamin B12. Hence, this is not an option for you if you are vegan which can explain the increase in greying hair on your head. Another catalyst to greying hair might be the intake of medicines or suffering from medical conditions that affect your ability to absorb Vitamin B12. If your hair is turning grey because you have a deficiency of Vitamin B12, the good news is that you can reverse the effects quickly. All you have to do is include foods that are rich in Vitamin B12 in your diet. 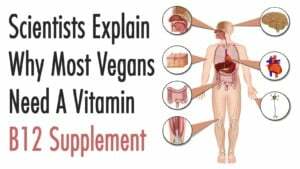 If you are vegetarian, take supplements that will boost your Vitamin B12. When you buy Vitamin B12 supplements, always choose the ones that are in natural form. These are also known as methylcobalamin. They are better and easy to absorb for your body. You can also consume beneficial vitamins and herbs such as zinc, cod liver oil, vitamin D and Bladderwrack to stop and reduce signs of greying hair. There are other helpful tips that you can use to prevent the growth of grey hair. Increase the number of fresh vegetables and fruits that you consume daily because they are high in antioxidants. Reduce the amount of caffeine, alcohol and junk food that you eat. Always try to exercise, remain calm and be joyful throughout the day. Avoid using harsh chemicals, hot water, and treatments on your hair. You can also avoid smoking. Ensure that you cover your hair when you are out in the sun. Additionally, massage your scalp to increase the blood flow in your hair follicles.